Greetings friends! Here we are, back to the routine after spring break. We enjoyed a fun weekend with some beautiful sunny weather, and lots of time outdoors. I'm looking forward to more warm temps this week, and hopefully, more flowers in bloom! The dogwoods in our yard are just beginning to bud and I can't wait to see them in full bloom. What's it like where you are? Has spring sprung for you? Here's a pic I snapped of Little Miss the other day. We took a field trip to a local historic home. We walked the grounds for a while and then she decided to take a seat by one of the outbuildings. I guess her little legs needed a rest. I love how small she looks next to the big door. And today I'm guest blogging over at In the Moment With. I'd love it if you came by to check out my post! That shot is perfect. Great composition.Also love how her curls are covering one eye. Gorgeous!! I have an obsession with cool doors! I love this! I love this kind of photography generally speaking. It really captures a mood and a moment. LOVE the contrast between her & the scale of the surroundings- well done. Hugs my friend! Such an enchantress she is. I am more enchanted each time I see a new photo of her. Maybe it is that I have such straight hair and hers is so stinkin ROCKIN curly... Beautiful capture. Love, love, love this! Her tousled hair is so adorable, and her expression -- stunning photo! looking cute! love her expression. 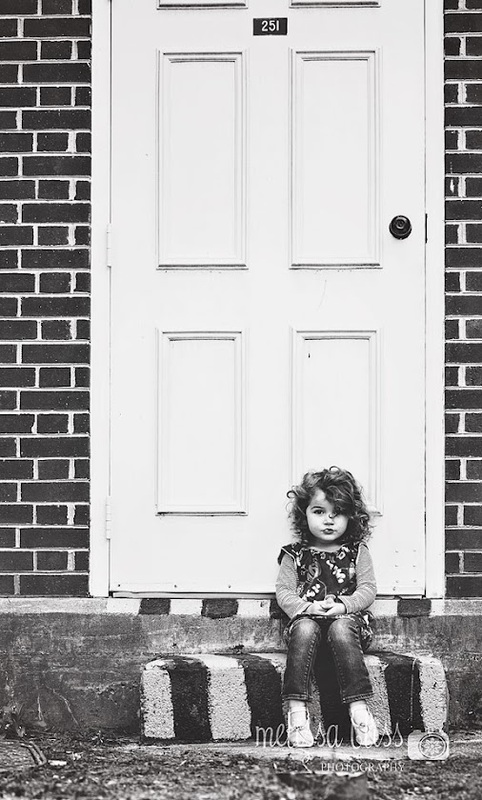 That is a huge door and such a sweet little girl. Great shot!